Every human being would no doubt want to claim to be a friend of the Earth but how many of us biped destroyers of nature’s good actually are. During the 1970s people started to become more aware of environmental issues and the negative impact that man was having on the planet. Friends of the Earth came into being to focus this awareness. Astrologically what would we expect to see in a chart of a founding director of FOE ? The sign that has the strongest affinity with nature is probably Taurus, but the Earth itself is beneath us so the part of the chart that would have the strongest connection with it would be the 4th house. This house and the 4th sign Cancer have conservationist links. The Earth itself is our mother and the sign with the strongest emotional connection to the mother figure is Cancer. This sign is particularly concerned with nourishment, support and with protecting something. There is, however often a tendency for Cancers to be quite conventional and to stick to old methods of behaviour. Friends of the Earth is a politically radical group that encourages people to rebel against the conventional ways that humans have of exploiting the Earth’s resources. As an organisation it has always appealed to the rebels amongst us. Of course the most rebellious of all signs is Aquarius. 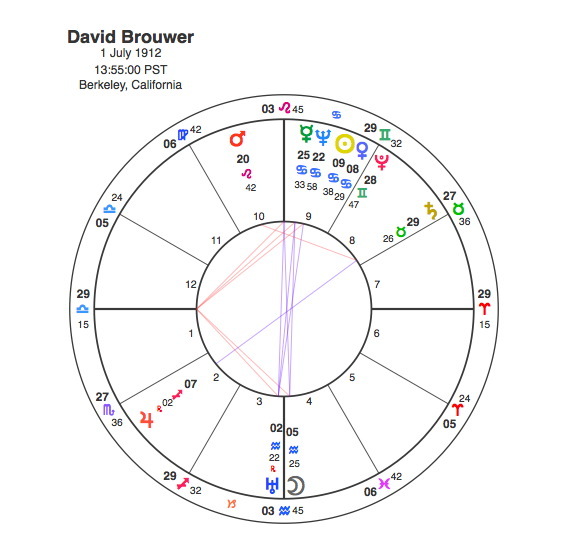 Its interesting that the founding director of Friends of the Earth was American activist, ecologist and conservationist David Brouwer who has the Sun in Cancer and the Moon in Aquarius in the 4th house. The Moon is conjunct Uranus in Aquarius on either side of the 4th house cusp. Uranus is the most unconventional of all planets, the one that will resist any attempts to curtail its freedom, the political idealist and even revolutionary. Aquarius is the sign that rules groups of friends coming together for social and political purposes. Friends of the Earth is the Moon conjunct Uranus in Aquarius in the 4th house. Brouwer also has 4 planets in Cancer including two conjunctions. The Sun is conjunct Venus showing an attractive and friendly personality able to draw others towards him. Mercury is conjunct Neptune which creates an emotionally idealistic way of thinking that his supporters would call inspired and his detractors would call woolly and naive. All 4 Cancer planets are in the 9th house of philosophy and travel. For 9th house people its important to have a philosophy that has a global reach. Its interesting that the Moon and Uranus in Aquarius is opposite the Mercury / Neptune conjunction. Aquarius is noted for its mental clarity whereas Neptune can let its feelings and intuitions about things take over so this picture shows that Brouwer has both a radical and intelligent insight but at the same time a feeling for things that can be attacked by opponents as being vague and unrealistic. As anyone who had 4 planets in the 9th house, Brouwer has traveled widely as an accomplished mountain climber, hiker and camper. In 1942, he served as a Lieutenant in the 10th Mountain Division, training its soldiers in mountaineering and cross-country skiing in Vermont and Washington states and earning a Bronze Star in action in Italy. Brower’s role in the 10th Mountain Division is featured in the documentary film Fire on the Mountain. Pluto was opposite Brouwer’s Moon and Uranus in 1942 – 3. As Uranus is so important in his chart it was no surprise that it should be conjunct his Sun in 1969 when David Brouwer founded Friends of the Earth. He was the organisations clear leader for over 15 years and was referred to in an interview as the ” Archdruid “. Brouwers directness from the Moon / Uranus conjunction attracted opposition from a number of people who thought him arrogant. The beginning of the end of his relationship with Friends of the Earth began when facing staff cuts in 1984, Brouwer appealed over the board directly to the membership for emergency contributions. He was removed from the board for insubordination, but was reinstated when he threatened a lawsuit. Pluto was conjunct his Ascendant in 1984. In 1985 the board voted to close the San Francisco office and move to Washington, D.C. and Brouwer resigned in 1986 as Pluto was square his Moon and Uranus. The Moon conjunct Uranus in Aquarius in the 4th house is astrological shorthand for Friends of the Earth and when Pluto came to square it, David Brouwer had to leave.